Now that Sir Graham has become King Graham of Daventary he needs a wife. In the second installment to the King's Quest series, Graham's magic mirror shows him a vision of a woman locked in a tall tower. 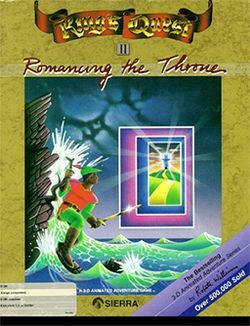 King Graham decides he must go off to find where the tower is located in order to save the princess, and with luck find his bride to be. This was the second Sierra Entertainment game to use the AGI (Adventure Game Interpreter) development tool. This page was last edited on 9 July 2016, at 19:39.